New Orleans! We were so excited to have Groundwork at our Barnraising and hope that some of you will check out their workshop this weekend on Native Plants. Free + Appropriate for all ages, but please make sure that you RSVP! The New Orleans Healing Center 2372 St. Claude Ave. and Spain St.
Make tea with native plants — fun for kids! Guest speaker: Samantha Gerlach, Ph.D. 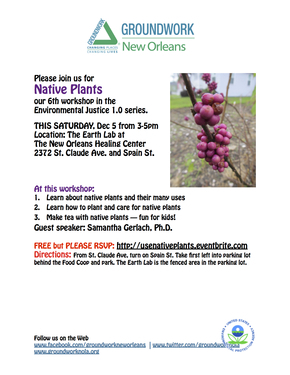 Most workshops take place at the Earth Lab, a derelict lot Groundwork transformed into a fun, outdoor learning space at the New Orleans Healing Center. Events are partially led and planned by our Green Team (high school youths learning environmental science and job skills). Workshops are generously funded and sponsored by the Environmental Protection Agency (EPA). Mission: Groundwork New Orleans, established 2006, is a trust of Groundwork USA. Groundwork New Orleans works to bring about the sustained regeneration, improvement and management of the physical environment by developing community-based partnerships that empower people, businesses and organizations to promote environmental, economic and social well-being. Vision: Groundwork New Orleans engages residents, volunteers, businesses and local organizations in practical projects that improve quality of life, restore the ecological function of the physical environment, and lay the foundations for sustainable development. For Residents: creating opportunities for people to learn new skills and take local action to better their community. For Neighborhoods: creating better, safer and healthier neighborhoods today and for the future. For Prosperity: helping businesses and individuals fulfill their potential, which ultimately makes the City of New Orleans a better, more prosperous place to live.